Longest Home Share Match is 6 years to date! Home Share Renters are individuals in need of housing that will allow them to pay an affordable rent, live in a comfortable environment and have long-term housing peace of mind. Renters can be students, adults, small families, or people on fixed incomes who don’t qualify for assistance. Renters are working adults who can pay rent but find costly applications and deposits to be barriers to obtaining quality housing. We have Home Providers who live throughout Pinellas County. Most Home Providers are asking a rent rate between $450 – $650 a month and this rate also includes utilities. If you are looking for a new housing solution, we encourage you to apply for our program! Click the application image to download it to your computer. You may print it and complete the answers by hand. Home Share is not a financial assistance program and funds are not distributed to participants. Instead, Renters benefit from access to quality homes with reasonable rent, NO APPLICATION FEES and NO DEPOSITS. This is home sharing arrangement can be an excellent option for Renters! Most often, the Renter and the Home Provider are so pleased with the living arrangement that it becomes long-term, with an average of 2 years length of stay. This is empowering for both the Renter and the Home Provider. If you are looking for a new housing solution, we encourage you to apply to Home Share. 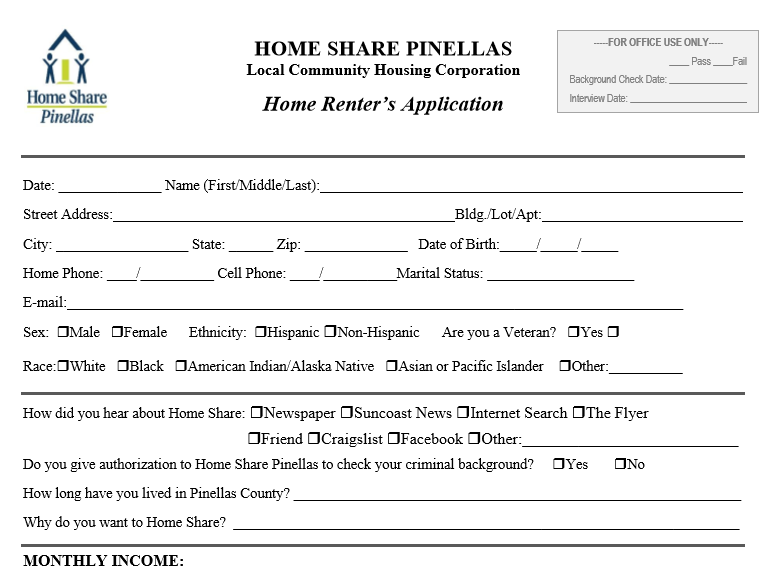 We have Home Providers all throughout Pinellas County and Home Share staff helps Renters find the location that meets their needs.